Florida Officials Swat At Mosquitoes With Dengue Fever : Shots - Health News After decades without any reported cases, dengue fever seems to be getting a foothold in the U.S. In 2009, it surfaced in Key West. This year, 18 cases have been reported this summer in Martin County, Fla. 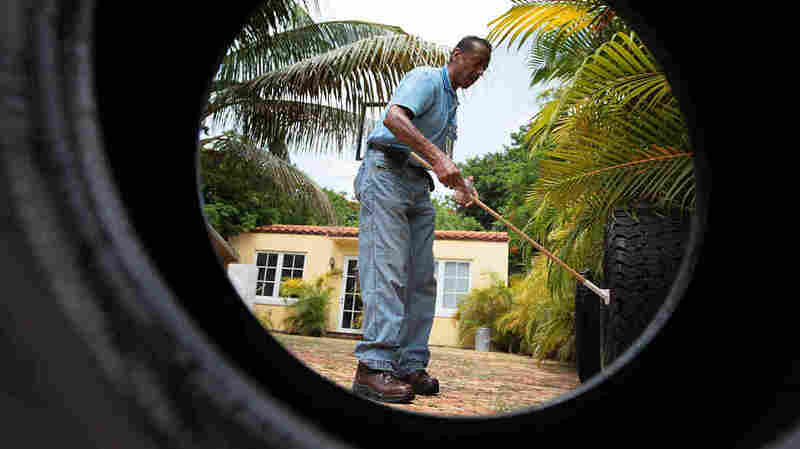 In 2010, Florida health officials looked for mosquito larvae in vehicle tires where water had collected. As many as 15 cases have been found in Stuart this year. Public health officials in Florida are once again scrambling to contain an outbreak of dengue fever, a disease spread by mosquitoes. Until 2009, when it surfaced in Key West, the tropical disease hadn't been seen in Florida in more than 70 years. Now there are concerns dengue may establish a foothold in the state. Mosquito control is always important in Florida, but in July it became urgent in Stuart, a quiet community on the state's Atlantic coast. Bob Washam of the Martin County health department says he heard about cases of a disease that seemed related but that doctors couldn't identify. "Initially the physicians felt that it might have been a chemical or something like that, because three people were sick," Washam says. Testing showed that it was dengue fever. So far, health officials have turned up 18 cases of the disease in Martin County and neighboring St. Lucie County. All of the cases seem to have been contracted in a few neighborhoods in Stuart. On a tree-lined street in a neighborhood of small cottages, Gene Lemire with Martin County's mosquito control department is checking one of his traps. "These other mosquitoes could be our little disease-transmitting mosquitoes," he says. "We'll have to take them back to the lab." The species Lemire is looking for, Aedes aegypti, is the one most likely to carry the dengue virus. He says they lay their eggs on the sides of containers, and the eggs hatch once water covers them. And then, he says, they "come out as an adult ready to bite somebody." In Rio, a community overlooking the St. Lucie River, Lemire points out potted plants, boats, tarps and other containers — all potential breeding areas. For the past month, his crews have been going door to door, emptying water from buckets and dropping larvicide tablets into larger containers in an effort to control the mosquito. When diagnosed and treated, dengue is rarely fatal. But it is debilitating and accompanied by a high fever, rash and joint pain so severe that it's been called "breakbone fever." "They got it right," says Marty Baum. Baum and his girlfriend both contracted dengue and have since recovered. "There's absolutely no comfortable way to be. If you lie still, it hurts. If you move, it hurts." He thinks they got it from mosquitoes in her backyard one evening. "At 9 o'clock at night, watching a Miami Dolphin football game, I was fine. A 10 o'clock my fever was 102 and I was almost convulsive with shivers." It's not unusual for travelers to the Caribbean, Africa or Latin America to return home with a case of dengue acquired overseas. But in Stuart, dengue spread to the local mosquito population, says Dr. Aileen Chang, an expert on dengue fever at the University of Miami Health System. And those mosquitoes have infected others with the disease. It's an outbreak similar to one seen in Key West in 2009 and 2010. Only about a quarter of those infected with dengue become sick enough to see a doctor. So far, health officials haven't been able to identify the person who brought dengue to the area. In Stuart — and everywhere there's a dengue outbreak — officials find themselves in a race against the disease. They have to work to educate the public and control the mosquito population before it spreads more. Dr. Chang has been advising health authorities in Stuart, and judging from the numbers of cases coming in, she believes this particular outbreak may have peaked. But it's not likely to be the last, she says. "The temperature and weather patterns are changing. We're seeing more dengue throughout the entire world," she says. "So now, having it creep up to Florida, the most southern part of the U.S., is not that surprising." In the audio of this story, as in a previous Web version, we incorrectly refer to Gene Lemire by the first name of Bob.